With a couple brief exceptions during this February’s volatility freakout, $NBIX has been beautifully riding it’s 50-day moving average ever since HOLLY first triggered an entry in this name back at $47.57 on June 21st. To say she nailed it for swing traders would be an understatement. The momentum of this stock shows no signs of abating, and HOLLY once again triggered an entry last week and today is confirming that the catalyst is real as it climbs back towards new highs on above average volume (broke higher after I sent this tweet — are the machines watching me??). As with all positions in the HOLLY Hot List portfolio, we’ll be entering as of tomorrow’s (Tuesday March 6, 2018) opening print and we’ll maintain it in the portfolio until such time that the stock experiences a 20% pullback from the high print we see while holding. This doesn’t mean you should place your stop losses exactly as we do. Please use risk management that makes most sense for your account and your point of view of market action. The goal is to have as much opportunity to capture alpha without exposing yourself to too much risk. 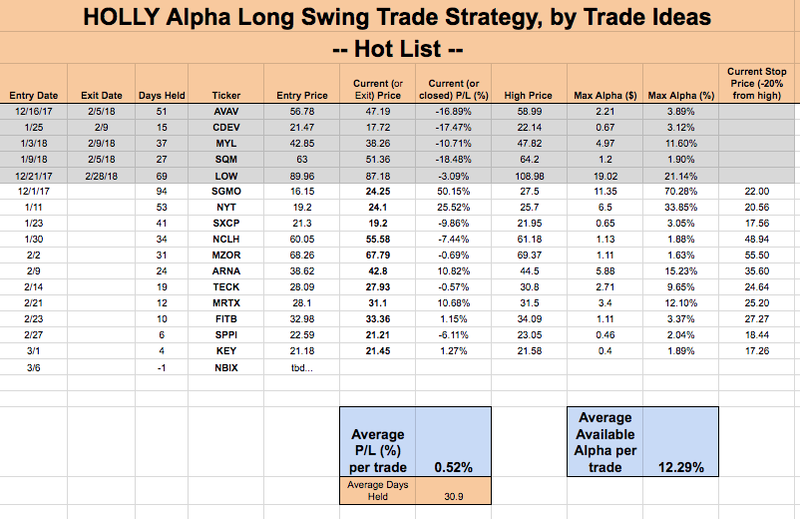 HOLLY Hot List Portfolio Update. For those closely watching, you’ll occasionally notice that stops listed for each position are raised in accordance with price action. We maintain a trailing 20% stop loss for all open positions. We’ve enjoyed some nice gains in recent days in MZOR, ARNA, MRTX which has been helping the portfolio out as leaders SGMO and NYT have pulled back a bit in the past week.